In this issue I would like to invite you to our next watercolour workshop in June The Architecture of Light, with Thomas W.Schaller. He has long been considered one of the foremost architectural artistsin the world. His strengths as a teacher are to emphasize composition over technique or medium an focus on to study the nature of light. He emphasizes the goal of not painting the object or scene in front of you as much as painting the light that defines it and gives it life. 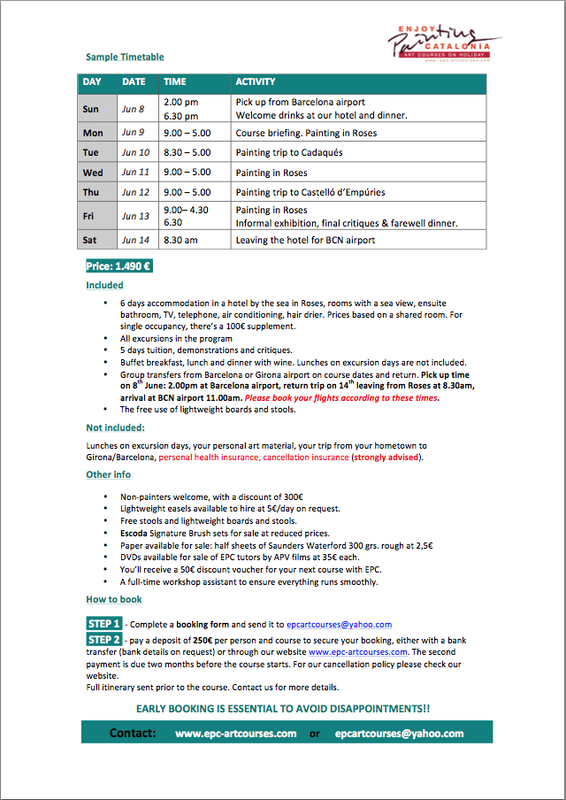 Just two places left, book now! We are very fortunate to live in such a privileged area of Spain: Girona province. Set in the North East just before France, our province has a very mild Mediterranean climate, with very little rain and warm temperatures all year round. In winter it’s around 10º-15º C during the day and 2º to -3º at night. It rains only occasionally and we can have a swim in our turquoise blue beaches since Easter up to mid October.But not only that: our coast, the Costa Brava, is one of the most beautiful in Spain, with the wild look of some beaches and coves in Mallorca or Sardinia, but also with bigger sandy beaches. Our workshop area, Roses Bay, in Santa Margarita beach near Roses, is a big sandy beaches, at the foot of Cape of Creus National Park, where flora and wildlife are totally preserved. That’s where Cadaqués is situated, one of the venues of our painting excursions. The other one,Castelló d’Empúries, A very rugged coast with unspoilt coves and maritime life, wild landscape, lost castles and prehistorical settlements. Near Roses is the Aiguamolls de l’Empordà, a bird sanctuary where they stop on their way to Doñana in Seville. Roses is the capital city of the area, at about 20 Kms. from Figueres and the Dali Museum, and 30 Kms. from France. I can’t resist the temptation to show you a clip of Sa Tuna, near Begur. 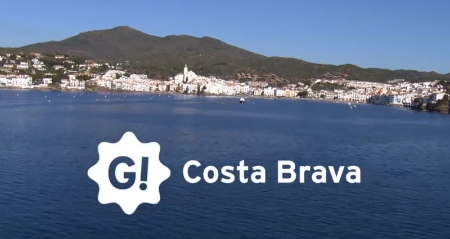 We aren’t going there, but that area encapsules the meaning of Costa Brava. In September though, we will visit Calella, the last place on the clip.But lets get focussed, have a look at this Costa Brava from the Airclip, up to min 1.20 is the Cape of Creus area. Between min. 1.00 and 1.20, that is Roses. Enjoy!! Following a 20-year carreer in New York City as an architect and architectural artist, Tom Schaller has long been considered one of the foremost architectural artists in the world. In the field, he has won every major award for his artwork – including being a two-time recipient of the Hugh Ferriss Memorial Prize. He has authored two books ; the best-selling, and AIA award of merit winner, Architecture in Watercolor,and The Art of Architectural Drawing. 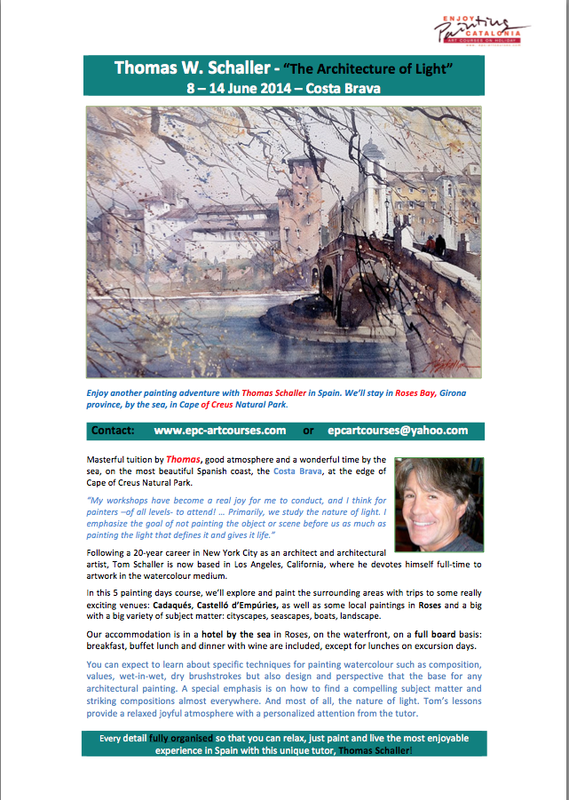 He is increasingly in demand internationally to conduct his watercolor workshop series, “The Architecture of Light”. His artwork is collected and exhibited around the world. NEW: If you book now, and you wish to cancel your course, up to 3 months before the course, you’ll get a refund of your deposit, except for 70€ of admin charges. RECOMMENDATIONSWe strongly recommend taking out a cancellation insurance in case of unforeseen circumstances, we will issue a certificate for claiming purposes. A health insurance is absolutely essential when travelling abroad.We warmly welcome you to have an uplifting experience of deep learning and sharing with fellow art lovers, in the Spanish sun eating and drinking Spanish food and wine.